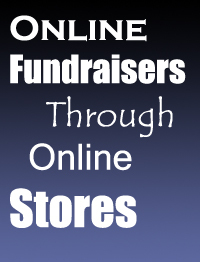 Online Fundraisers - Through Customizable Online Stores! There are a few different online stores that are providing phenomenal Online Fundraisers for Charities and Nonprofits! These stores provide a great way for your cause to setup a free fundraising campaign through the sale of items (often customizable) through these FREE online stores. For the most part it is simple enough to setup one of these online stores but actually turning them into a successful fundraiser is a different story. The success of your store will essentially come down to how effectively you promote it! The more you promote... and the better you promote - the more successful your Online Fundraisers will be! So make sure you read the Promoting Fundraisers page to get some great ideas for marketing your fundraising campaigns! 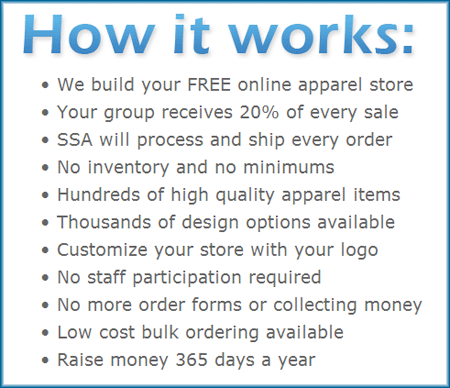 SSA Apparel Stores provides a phenomenal Apparel Fundraising platform for Nonprofits, Schools, Churches and other fundraising causes in the USA. They provide a wide range of top quality apparel items that can be customized with your organization logo and branding! It’s free to setup a store with them and you receive 20% revenue for every item sold from your store! To setup an Online Apparel Store with them click here. And read this article if you want to find out how to have a super successful online Apparel Fundraising campaign! There are quite a few ways of fundraising with eBay and one of them is through the sale of products. Think of it like a garage fundraiser sale... Just online! The really cool thing about selling as a Nonprofit organization off eBay is that your products get highlighted by a charity ribbon. Essentially helping single out your products from the millions of others that are listed there. For info on fundraising with eBay read here! Amazon’s affiliate program provides an income for thousands of affiliates across the globe and although it has it cons, for the right charity causes it can provide a great fundraising opportunity. It is essentially Affiliate Fundraising, but their aStores provide a platform to help you more effectively promote their products! Amazon’s aStores are highly customizable affiliate stores that can be placed on your website or blog promoting specific lines of products from Amazon. Obviously if you want this store to be a success you need to choose the right type of products for your audience and then, just to repeat myself, promote those stores effectively! To setup an Amazon aStore sign up to their affiliate program here. CafePress is another Apparel store platform that is available worldwide but is not focused towards fundraising like SSA Apparel Stores is. All the same though, it provides a great fundraising opportunity for organizations to make use of. To setup a CafePress store go here.